If you’ve ever seen a Cirque du Soleil show at the Royal Albert Hall, you’ll know exactly what to expect from their latest. 'Ovo' is a dreadful clown comedy, enlivened by a series of jaw-dropping acrobatic interludes. This is my main problem with the devastatingly successful Canadian circus franchise: it has the best performers in the business, but the shows are absolutely chocka with sophomoric gooning around that I’m reasonably certain nobody really asked for. First seen in Montreal in 2009 and making its UK debut here, ‘Ovo’ – created and directed by Deborah Colker – is notionally themed around insects, though this has little bearing on the physicality of the show beyond Liz Vandal’s garish costumes. There is a plot, of sorts, following a pair of dopey flies (I can’t tell you who played them as no performer credits were issued to the press) who fall over, fight and occasionally rub their faces on the breasts of a lady fly. I did not find this particularly endearing. But the prowess of the show’s acrobats is undeniable. A guy juggling four glowing diabolos at the same time pretty much blew my face off; a fella unicycling upside-down on a tightrope made me question whether we were even the same species; and a joyous, trampoline-based finale was, you know, actual, brilliant fun. If only the feats constituted a higher proportion of the clowntastic show, and if only the basic formula didn’t essentially adhere to that of every other Cirque du Soleil tour to rock up here in the last decade. The insect concept is promising, but ‘Ovo’ swats away any hint of risk. Absolute disappointment . Went on 27 Feb 2018 . Not the quality that used to be . Will never return to want him the show again ! Well I totally disagree with the TimeOut reviewer Andrezej Lukowski, who has given this amazing show only two stars! Even if you don't love the light-hearted comic story line - and I personally adored it - it's worth several stars for the sheer daring and skill of the acrobatics and the colourful sceptical of the show. It goes without saying, the skill of the acrobats is incredible and keeps you on the edge of your seat. The singer was stunning with a wonderful voice, providing a lovely vocal to orchestrate the show and the small touches of comedy and banter between the characters tickled me and was very charming. Now this was my first time to see Cirque, so I have nothing to compare it to. But in it's own right, I found every minute of the show a joy to watch. Sometimes I held my breath as the stunts got more and more daring. Sometimes I giggled with joy at the cuteness of the insect flirtation. I feasted on the visual delight of the costumes and backdrops to the stage and couldn't believe the skill involved in some of the 'simplest' of acts - such as the juggling of the kiwi fruits. Oh and I was also extremely envious of the trampolining green ants - they looked like they were having the time of their lives. Imagine doing that for a job? 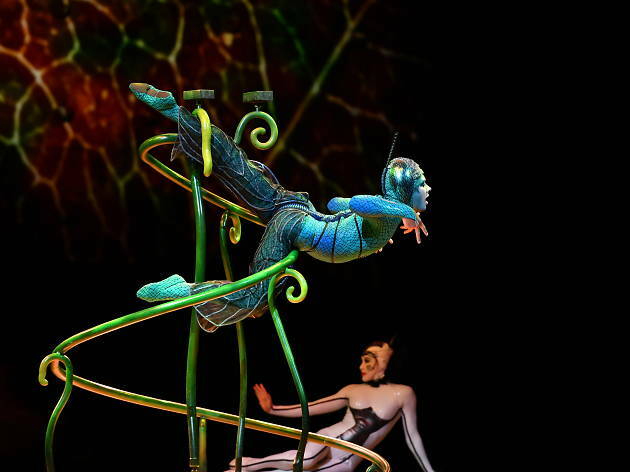 This Cirque probably had the strongest theme and seemed to forgo the usual long storytelling. Still it was fascinating to see the different insect acts show off skill, though I agree that none of the acts were as mind-blowing as those in shows like "Amaluna,"
Saying that the trapeze style act without the trapeze was really cool as was the slackline act and trampoline/climbing wall display. The comic act usually is a bore and just filler for most Cirque shows. However in this one I have to admit I did enjoy the little love triangle between the wasp, ladybug and scarab beetle. We suspected the volunteer they got up from the audience was one of their own as she also was super slick in her performance. Still it was fun to watch. Overall this show was very entertaining with clever costumes and a beautiful set. The soundtrack was also lovely and set the right pace for the show. I took a friend as a birthday treat and was a magical night which should be expected with Cirque by now. An acrobatic interpretation of bugs life is filled with talent and full of surprises. My favourite act was trampolining crickets.... nothing more needs to be said. The best was he had some of the cheaper tickets high up in the gods and the view was incredible seeing all the patterns and colourful costumes. Cirque du soleil really upped the game of the circus world. No longer can you get away with shoddy tricks like ringmasters with their heads in the tiger’s mouth. No no, Cirque do not use any animals in any of their shows and have an amazing cast who bring to life whatever they are portraying in the most scary, skilled circus ways. The main storyline is about a poor insect who finds an egg and then falls in love with another insect. Its cute as a sub storyline and is a very good way of distracting the crowds whilst various safety hardnesses / mats are being set up for the next big act. My friend treated me to a standing ticket in the gallery which is up in the gods. It was a good price at £22.50 and the view wasnt that restricted (except the trapeze artists but we just crouched down to see that bit!). Also although standing, you can sit down on the floor, just bring a cushion for your bottom! Some of the acts really stood out for me, I loved the juggling of the kiwis with the feet, i think it must have taken lots of practise to do it in sync with the rest of the team. I also loved the tumblers at the end, they really did look like insects up on the wall. It’s a crowdpleaser and I love it. Only 4 stars because I feel other shows they have done previously were more technical and taxing. Something new for this year, they let you film and photo the performance as long as you dont use your flash! Good on them for getting with the times. Ovo - translates 'egg', it's a Canadian Cirque Du Soleil show currently presented in Royal Albert Hall. Its main characters - modern clowns are two silly flies who are fighting over a sassy lady bird  I am actually finding these strange clown-creatures the least entertaining in the Ovo show. But they do what needed - distract the viewers attention while the crew is preparing a new platform for a proper incredible act. And there are many! It's an amazing show and the only reason for 4 stars as the other Cirque Du Soleil show is way better - Amaluna deserves 6 out of 5, even though it's not possible but that's only my opinion. In the OVO show - one of the most thrilling act is an athletic acrobat,which was riding upside down a unicycle, was swinging standing on a stick, jumping up and down and all this his was performing on a highwire up in the air. Absolutely jawdropping. Several acrobatic acts, which looked effortless but what they were showing were incredibly difficult performances. Beautifully choreographed as well. Up in the air,they were literally holding each other by one hand only, one foot held up in a rope and at the same time twisting, bending, spinning, looked unreal. And then there were some grasshoppers acrobats,who were almost defying gravity, creating an illusion walking on the vertical wall. They were like Spider-Man flying in the air. 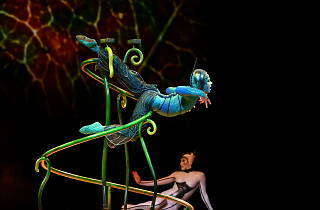 As usual for Cirque Du Soleil shows the costumes, make -up, staging, props, music, choreography is absolutely top notch! And you are allowed to take photos and videos!